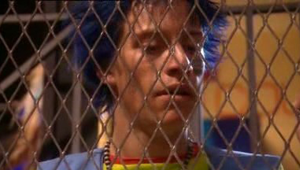 Luke is first seen in series one, as a member of the locos. 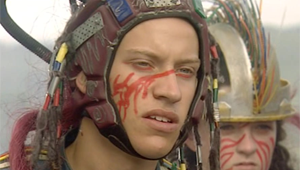 Later Luke joins the Chosen, and becomes The Guardian's lieutenant caring out the Guardian's orders. Luke is a believer in order and stability and brings this to the Chosen. After being with the chosen for a while, Luke starts to feel that the new world can be made good, and positive instead of 'power and chaos'. He has doubts about the Guardian's extremism, and fanaticism and starts to care more and more about the Mallrats and their point of view. Luke meets Ellie and over time they fall in love with each other. Luke convinces Ellie that he is not a bad guy and is in fact a good guy. After the fall of the Chosen to the rebels, the tribes demand justice. Since the Guardian cannot be put on trial due to him being crazy they put Luke on trial. Luke admits to all the bad things the Chose did. Everyone thinks the sentence will be guilty, But Judge Amber lets him live giving him his freedom, and saying 'his punishment is to live with his crimes and his conscious'. The other tribes are upset at this and let Luke know if they see him outside the mall he is a dead man. Afraid Luke stays in the Mall with Ellie, and becomes Ebonys finance minister. Tired of living in fear Luke decides to leave the mall. On his way out of the city Luke stumbles across the Guardian who has escaped. The Guardian offers to take Luke with him as he has seen the true bringers of power and chaos. Luke decides to go with the guardian and they leave by plane flying to an unknown destination. Luke is never seen again. As lieutenant he wears a simple white robe. 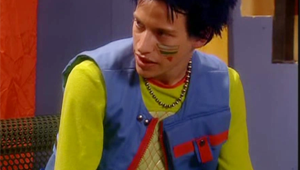 After Luke leaves the Chosen, he wears a long sleeved top is made of a bright fluro (fluorescent) green fabric. It has a crew neckline, which is trimmed in bright red. Across the front is a panel, which is actually a very fine plastic that has been sewn over the green flannel and has been criss-crossed in large red stitches. A blue vest with very large toothed red zip. Luke's pants are made of blue leather and have a very tapered leg. They do up at the front with a long metal zip. At the knee's there is extra padding in a few panels so it's possible these could have been motorcycle pants.